In the ultimate tribute to Dubai, TAG Heuer announced the launch of a unique timepiece it has designed in collaboration with the Dubai Department of Tourism & Marketing (Dubai Tourism) at Arabian Travel Market (ATM) held at the Dubai World Trade Centre. Senior Dubai Tourism representatives and Philippe Roten, Commercial Director of TAG Heuer, were present for the occasion. The Dubai Special Edition was exhibited during ATM, the market leading, international travel and tourism event unlocking business potential within the Middle East for inbound and outbound tourism professionals. The Dubai Connected Watch Modular 45 is a living testimony to a successful partnership between two brands whose brand values both represent a harmonious blend of tradition and modernity. 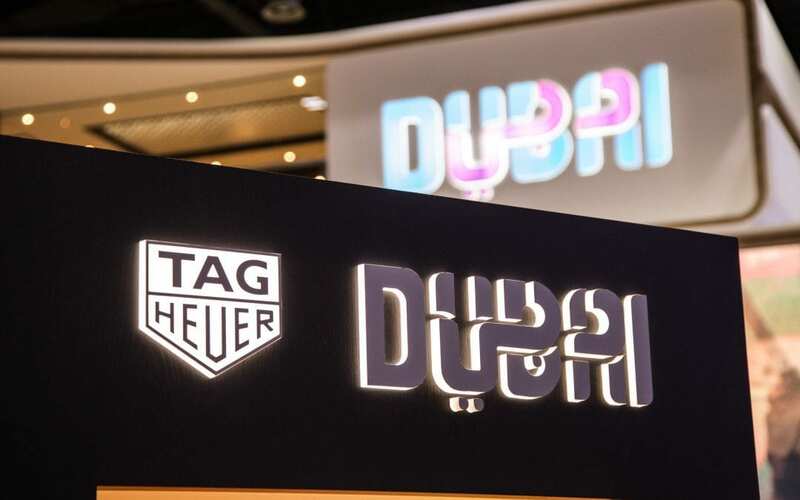 While TAG Heuer prides itself on its rich Swiss watchmaking heritage and Avant-Garde Spirit, Dubai has become a name synonymous with dynamism and a digitally connected spirit. The Dubai Special Edition timepiece is mounted on a brown calfskin strap with rubber lining with an exclusive “DUBAI” embossing. The piece also has a spare strap in the unmistakable shade of blue associated with Dubai. A special case back has been created with an engraving of the Dubai logo. The partnership between TAG Heuer & DUBAI has also resulted in the creation of three innovative digital watch faces that will be animated throughout the day. The first option alludes to the fact that Dubai is a “City That Never Sleeps” and is for the fashionable user who aspires to attain an understated yet sleek night time look and feel. It will reflect a metallic finish and elements included are the shade of blue that is specific to the Dubai branding. Titled “The Land of Desert and Sea”, the second face recreates a sense of tranquility that takes users on a sensory voyage of the senses. The colours presented suggest an ocean or desert-like vibe and change slightly through the day, representing a different state of time. The stylistic approach lies between classic and thematic. “Your Time, Our Essence”, the third option focuses on icons that represent Dubai and its culture. A unique icon – such as the Burj Khalifa, Burj Al Arab, and a falcon and peacock – will be used for each hour while the background remains sleek to give the icons a statement pop. This approach gives users an element of surprise and personalization for each hour with 24 icons for 24 hours of the day. Watch connoisseurs will be pleased to know that 200 timepieces, priced at AED 8,000, will be made available to the public from the third week of June, which will make it the perfect g ift for Eid.